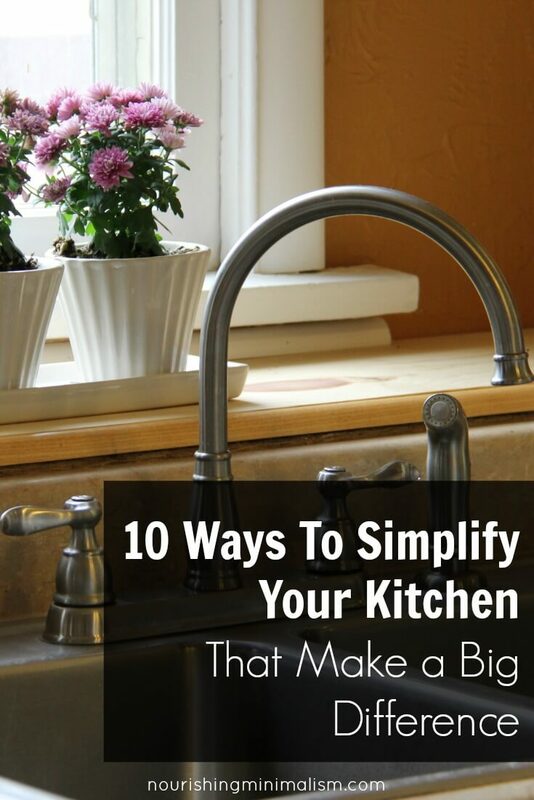 When you simplify the kitchen, everything gets streamlined and the days flow easier. Since so much of life is lived in the kitchen, paring things down so that it’s completely manageable simplifies life on pretty much all levels. When the kitchen is streamlined it’s easier to prepare meals and whatever mess happens through the rest of the house isn’t as overwhelming, because there is one area that is simple and easy to do what you need to do in. The kitchen is the best place in the house to begin simplifying because it’s a utilitarian space. Most of the objects in the kitchen are tools or consumables and take much less thought to sort and know what is important and what isn’t. When decluttering your home, always save the sentimental items to declutter last. If you set out to declutter your kitchen and come to a stack of birthday cards or children’s artwork, if these items bring up those sentimental feelings, then set them aside somewhere else in the house to deal with after you’ve decluttered your main living spaces. Pare down the Tupperware. Pull all your food storage containers out of their drawer or cupboard and immediately discard all the cheap plastic containers (think: yogurt, sour cream & cottage cheese containers). If they can be recycled, then great. But if not, don’t worry about it – you need to just get them out of your home and cupboard. Look at what’s left and pick out enough containers to last you a week: approximately 10. I keep only 10 containers and there are 7 people in our house. Keeping it down to this amount means that when you see there are no more containers available it’s time to clean and fridge and have a left-over night for dinner. This prevents containers from being pushed back in the fridge, forgotten and growing. Evaluate the decorations. Do you love the decorations in your kitchen? Or are they there because “that’s what should be there.” I see this most with cupboards and tall ceiling: most people feel that there needs to be plants or ceramics or some cute shabby chic decoration. If you love these items, then keep them. But if they are just there because “there is supposed to be something up there,” and the dust on the plastic ivy annoys you… then take those suckers down and be free of them. It will give your kitchen some breathing room and there will be no more “I should dust that” thoughts running through your head. Minimize the dishes. 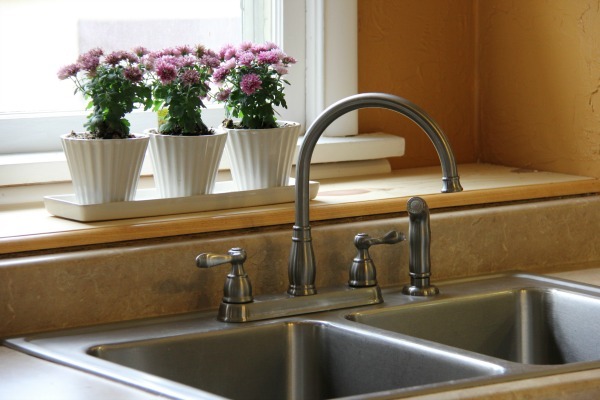 Getting down to only the dishes you use daily is a tremendous help. It forces one to wash dishes consistently, which means that the dirty dishes never take over the kitchen again. You know… the ones when you’ve waited for 4 days to catch up on dishes and now it’s going to take 3-4 hours to do them all? When you pare down to only what you use each day, they can all be done in a few minutes and you can start fresh in the morning. Forcing yourself into a new routine is one of the best ways to develop it: there are no other options. Let go of the excess pots & pans. I’m sure you know which pots and pans you gravitate for and which ones you keep in the back of the cupboard “just in case what you need is dirty or breaks, etc.” Instead of being helpful to you though, these pots and pans mean the dishes pile up easier. It means you have to do more work when getting them out of the cupboard and putting them away again. Keep only the ones that you like using because they fit your needs. Get rid of the rest of them. Gather all papers and sort. Have 3 boxes: trash, deal with (this includes bills or anything that needs a response), keep (warranties, insurance papers, etc). Change your mail routine. As soon as the mail comes in the door, it needs to be sorted. Stand over the trash or recycle bin and discard junk mail immediately. Have a designated place for bills and file anything received ASAP. Dealing with it this way means that there will no longer be “paper piles of shame” that build up in your home. Sort out the cooking utensils. This is one of those categories that can easily become overwhelming. Especially if you’re one to attend Pampered Chef parties on a regular basis. 😉 Sure, tools make our life easier. There are some great ones that make a big difference – and we should keep those. For example: If you eat fresh pineapple on a regular basis, then, by all means, have a pineapple corer. But if you have fresh pineapple every couple years, at best, then there is no need for a pineapple corer to take up so much space in your utensil drawer. Pull them out and as you pick up each item, ask yourself: when the last time you used it? Does it make your life easier? Do you like using it? If the answer is “I don’t know” or “rarely”, then free up that space in your utensil area and give that item to a new home. Large Kitchen Items. How often do you use your rice cooker? Crockpot? Griddle? Turkey roaster? If it’s been years, then you can free up so much space by letting them go. But, how will we cook the Thanksgiving turkey?? If you rotate who hosts the family gathering, there is no need for every family to own a turkey roaster. On the year you need it, borrow it from someone who is not cooking the bird. Think through all the large items you have in your home and honestly ask yourself when you used it last and if it’s realistic that you will use it again. It’s ok if you jumped on the home-made bread kick 10 years ago and now have no desire to make your own bread. Give yourself permission to let go of the items that aren’t serving you in this stage of your life. Serving and Entertaining Items. Few people entertain in the traditional sense. The upcoming generations are choosing low-key gatherings with regular dishes and sharing everyday meals. This simplifies so much!! It means that having people over to share a meal is easier and you don’t have to put on a show. There is no need to have beautiful platters, fancy crystal bowls, and seasonal place settings. (Unless of course, that is your thing.) Invite your friends to share a meal, set the soup pot in the middle of the table and enjoy the company. Let go of the serving dishes you don’t use and don’t love and just be yourself around your friends. Purge the cleaning supplies. So many companies have made us believe that these supplies are all that’s needed for a tidy home. Spray it on, spray it off and boom! Your house sparkles. We all know that’s not how it works, but when we’re desperate for order, it’s easy to pick up that bottle and try it out. When it doesn’t work, it ends up in the cleaning supplies graveyard under the sink. But when you set up cleaning routines in your everyday rhythm, you don’t need to rely on heavy duty cleaners. Simple soaps and cleaning cloths are all that is needed to maintain a clean house because it never gets out of control. Pare down your supplies to only the few you use on a regular basis. Box up the rest and either donate them to an organization that helps set up homes for people getting back on their feet or call your local waste management company and asks how to dispose of excess cleaning supplies. The kitchen can be a mayhem if you don’t declutter your tools. Also, it is important to question if you really need some particular tools before you buy them. Oops….I sure messed up the type style…thought I was in caps all along and it was driving me crazy. Not screaming at you all. I promise! That’s a great way to handle it Diana! I love the idea of borrowing!!! The thought of having to buy a turkey roaster (I’m engaged and getting married) even if I know iI will use it once a year makes me cringe! I love the idea of asking the community around me for help. We don’t do that often enough nowadays. I loved your response. I think a lot of people don’t know how to ask for help from the community anymore. As a society, we’ve become so accustomed to being “alone with our technology”, that I think it doesn’t occur to people to ask for help or sharing a load. I agree! When we talk to each other and share things, it builds relationships and community. THE HARDEST PART FOR ME IS THE GIFTS. BOTH SIDES OF OUR FAMILY ARE REALLY BIG INTO KITCHEN GIFTS. WENT THROUGH MY KITCHEN IN DETAIL THIS WEEK AS WE WERE GIFTED A BREAD MAKER AND VERY LARGE SKILLET FOR CHRISTMAS. BOTH SIDES OF THE FAMILY DO THIS, AND IT WAS AMAZING WHEN WE WERE A YOUNG MARRIED COUPLE WHERE THESE ITEMS WERE OUT OF REACH FOR US AS THINGS WERE TIGHT. NOW THESE GIFTS BEGIN TO FILL SPACE. THERE LITERALLY IS NOT A PLACE FOR ME TO PUT EVERYTHING AWAY SINCE THE ADDITIONS FROM CHRISTMAS. THESE ARE GIFTS THAT THEY CHECK IN ON LATER, HOPING THAT WE ARE GETTING GOOD USE OUT OF THEM YEARS LATER. I NEED TO FIND A KIND WAY TO REDIRECT THE GIFT GIVING AND/OR LET THEM KNOW WE HAVE EVERYTHING WE COULD NEED. I would say remind people that your home is pretty stocked and you no longer are into bringing new items or gadgets into the home. Then if they continue I would say it is okay to return or regift items without guilt. I think it helps people with the transition too if we then model how we enjoy experiences more than items. Giving gift experiences to them is a nice way to model it especially if the experience includes YOU! I took a picture of all the kitchen things no longer wanted or needed (gifts) sent it to all my adult children & my daughter in laws, and they all responded they wanted certain items luckily no one wanted the same thing, and what was left I donated to my local AmVets post for their kitchen. They got a never used 13 cup Cusinart Food Processor, a the KitchenAid mixer I used maybe 5 times and one huge lobster pot. They sent me a thank you card telling me how much prep & time they saved making meals for the local homeless veterans every day. I have never felt so happy to get rid of things. Wonderful idea to donate to AmVets!. I’m really enjoying your blog! Thank you for wonderful advice and encouragement. I’m also loving the 2017 decluttering chart! Let go the the guilt. Most of us were encouraged to request nice china in a wedding registry, but if you don’t use it, it really has no place in your home. The gifts already served the purpose in your life: you appreciated the thought and appreciated the people that gave. That’s all that is important. Gifts should not be a burden, so if they are, it’s time to let them go. Some places buy fine china, and it wouldn’t be wrong to get something you would use instead, or to do something fun with. I am new here. Is it okay to mention a website that buys and sells China patterns, silverware patterns, etc? I have bought items from them but never sold. for the glassware, unless its crystal and needing more care than you are interested in giving it, or already have more than you need, how about just putting it in the cupboard and letting it become part of daily life? all glassware breaks eventually, right? This was a really helpful set of tips. I grew up the chiLd Of A subclinical hoarder and i long for clean and cleared countersPace. Also recently streamLined my cleAning supplY plan and i feel much more in control now. I recommend that For anyone that doesn’t mInd cleaning but doesn’t feel as on top of it as they want to be. Great post! We host our family to Easter dinner every year, and I use my china then. I’d love to get rid of it, but I feel I have set up an expectation for the family (mine and extended) that this is what Easter looks like — pristine and fresh. So I will keep the china until the kids gets married. If they don’t want it, I’ll feel like I don’t have to keep it either! Last year I donated lots of plates I did not like and did not use any longer, as I was given them short after my moving in when an acquaintance moved away. when I bought some plates I really liked it was simply too much. And I got rid of the drinking glasses for alcohol, too and kept only the wine glasses for my guest. Everything else was never used. I did not touch the Mugs or travel mugs that time. but this week I gave away some that I only useD in College and in my job before the last. I don’t miss them! Each remaining mug is loved and often used. It’s great to have that decluttered, so thanks, Rachel! I’m struggling with one small area – my new daughter-in-law gave everyone in the family a mug she made in her ceramics class for Christmas. They are smaller than we normally use, and heavy. I tried using one for a pencil holder, but it scratched the desktop, so that’s not going to work. Wondering whether I can get away with giving 3 of the 5 to the thrift store (she lives far enough away and its a tiny shop so no worries on her shopping there) and just leaving 2 at the back of the cupboard until the end of the year. Or is it silly to even worry about keeping 2? I’m not keeping all 5 and none of the kids want theirs in their rooms, so….. I have simplified my kitchen a lot over the past year, but I still feel like it is a big mess. I am at a loss on how to simplify it further. What tips do you have for someone who feel stuck? I am getting a new kitchen next week so I am decluttering big time. I have decided to buy a dish washer for the first time as I would always have a clear space. When we moved to our Tiny House On Wheels (THOW) we decided we would no longer do big turkeys. We chose a smart toaster oven. If we couldn’t cook something in there, we would either make something different, have the meal catered, or go out to eat. Sometimes traditions just need to change. After decluttering with help of this group about 5 years ago I’m happy and proud to see that I still pass. As for the serving stuff… I’m going to ask my mom if it’s OK to sell the gold rimmed dishes I inherited from my grandma. I love them and I wanted them but they’ve been in my garage for 11 years now without being used once… And a similar set is sitting in my mom’s cupboard. My husband does all the cooking now that he is retired, which is great! However, he has all the countertops filled with everything from five different kinds of flour to two different coffeemakers and a huge electric roaster. We have a very large walk-in pantry, but he says he likes to keep everything right in front of him. When we built the house I had several large shelves put in the kitchen with the thought that canisters, etc. would go there and I could have countertops with nothing on them. This backfired, as the shelves are loaded down too. How do you handle a spouse’s clutter? I have told him how stressed I am from looking at this mess, but it doesn’t seem to get though to him. He also shops sales and has filled the house with enough toilet paper, paper towels, jugs of laundry detergent and anything else you could think of to last until the end of time! Someone…HELP! I would ask him to try an experiment with you, to hopefully help him understand where you are coming from. The experiment: Put everything in the pantry and have clean counters as you want, and keep it that way for a month, then revisit. Ask him to pay attention to your attitude/interactions during this, so he has some “markers” to go by. This also may mean that you need to volunteer to put things away after he’s done cooking. Remember that if something is important to you, you are the one that will need to do it. Don’t expect him to do it if he doesn’t care. Perhaps he’ll be willing to do it for a month if it doesn’t require him to be putting things away all time. I don’t want to fill landfills and sometimes it’s possible to pass things on to people who can make use of things, but sometimes there is no way to recycle or reuse it and no one will take it- in that case, our homes should not be a storage unit for the landfill. I really like this mentality!